Christmas was but a distant memory when we set off early on Boxing Day on a long-planned road trip subsequently dubbed ‘Australia: it’s a bloody long way’ after a fridge magnet we bought in – spoiler alert – the souvenir shop at the base of Sydney Tower on this very trip. With a two-week-long Christmas break from both my and Tina’s work, and of course Alexander and Eoin on their Summer holidays, we realised that the only way we were ever going to see this far too humongous country was to pounce at chances like this one. 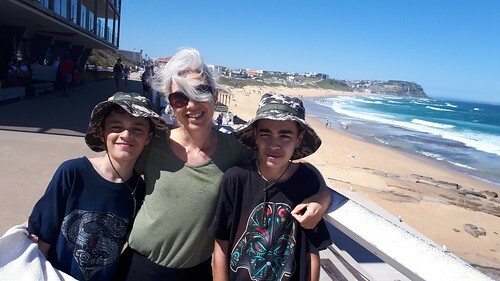 And so, having distributed our accommodation requirements between family members, motels, Airbnbs, and couchsurfing hosts, we dropped Maya the moodle off with our neighbours, piled into the car and drove south. We were over the border and into New South Wales by eight-thirty in the morning. With the exception only of the landlocked Australian Capital Territory, NSW is where we planned to spend the next ten days. In a country with vast states and territories, this one is a bit on the small side, but the richest in the country, for my money, in terms of things to see and do. Other than a quick stop eating cherries on the steps of a town hall in the quaint and these days bypassed town of Newrybar, we chased the highway into the Northern Rivers region, crossing the mighty Clarence over a worryingly decrepit bridge into the city of Grafton for lunch, sixty kilometres downstream from the seaside town of Yamba, where we’d spent the past October holiday weekend. In the memorial park in Grafton we sat at a picnic bench looking out over Susan Island, a fertile, bushy sliver which bisects the river. Aboriginal women still use the island as a source of food, but we had Christmas leftovers to go on. By late afternoon we’d reached the Big Banana, mascot of the erstwhile cash cow of this region, which meant we were at Coffs Harbour, nearly halfway to Sydney. The plan was to drop anchor there in Coffs, so we found a beach just off the road with the true blue name of Diggers Beach and had a late afternoon splash around in the surf. Best thing to do with a couple of kids who’ve been bunched up in a hot car all day. As Alexander and Eoin played in the sand, we read, and later watched as the two young lifeguards packed up their gear, piled it into the back of a ute, and left what few swimmers there still were to their fate as the afternoon gave hints that it might also be packing up for the day. After dinner (more leftovers) we went down to the eponymous harbour at Coffs. The marina was nice and breezy in the early evening. Around a hundred years ago they built a causeway linking the town to a place called Muttonbird Island, so-named on account of the tendency of migrating shearwaters, commonly called muttonbirds in this country, to stop there (I’m not sure about the name: it makes them sound like flying cooked pigs). At the end of our first day, with the seabirds riding the reserve winds overhead, we looked west from the top of the island at the sunset, our first of the trip, over the Great Dividing Range, which here on the Banana Coast is the only place the range swings right out to the Pacific. Morning coffee was one hundred kilometres down the road at Kempsey, on the meandering Macleay river. Another hot day. Consulting our battle maps, we noticed that the road would shy away from the coast for most of today’s drive. No swim till Newcastle. 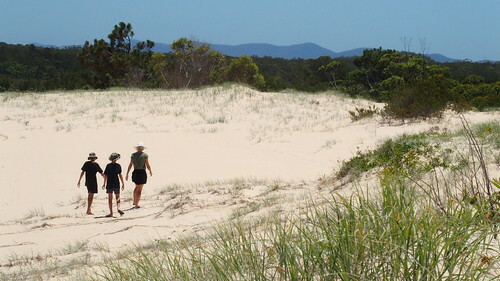 After a stop for a chat with the genteel ladies in the Myall Lakes National Park information centre, at the township of Tea Gardens, we drove through the scrub and the dunes, stopping at Dark Point for a quick walk (still too hot to do much) over the massive sand dunes. With the campers and the fishers and their intimidatingly large and dusty, well kitted-out four wheel drives we waited in the heat to be ferried between the lakes, and thence back onto the highway south. Tina’s parents got married in Newcastle half a century ago, but like the respectable daughter she is, she hadn’t been born yet, so other than flying drive-bys over the years she’d never really been to the city. Nor had I. We’d taken the road west through the Hunter Valley on the one occasion we’d driven from Sydney to Brisbane. But today, with the temperature in the mid-30s, the city’s virtues were too good to drive past. ‘There are few cities in the world that can say that their city centre is surrounded by eight spectacular beaches’, it says on visitnewcastle.com. We braved the crowds and pulled in at beach number eight (going from top to bottom), Mereweather (pronounced ‘Merryweather’) Beach, where I took off my sandals and cooled my overheated feet in a rock pool from which fussy crabs got out and crawled away. Floating on my back, looking at the cloudless azure, I thought how at 160kms from Sydney we were well within the great city’s weekend getaway zone here in Newcastle. We had entered its gravity. All we had to do now was dry off, get back in the car and roll ‘er downhill to Tina’s brother’s place, which is where we’d be staying for the next three nights. First, though, all I had to do was move, and get out of this rockpool.